I don’t generally blog about me; well, I do, but in the I did this sense, rather than I felt this, or here are the deep, dark bits of my life sense. This blog is going to be an exception. Once I was editor of the newsletter of my local NCT branch. The first issue I did was on miscarriage. I wrote about mine; a friend wrote about hers, and the Miscarriage Association wrote about what needed to be done by the NHS to improve how women and their partners were treated during and after miscarriage. We said things like: don’t put miscarrying women in wards with women having terminations, or worse still in ante natal wards. Treat women sensitively. That was 17 years ago. Mumsnet is starting a campaign on how the medical service should treat miscarriage, and I’m sure you can work out what they’re asking for. 17 years later, not a lot has changed. What happened to me is still being repeated, and what we asked for then still has to be asked for now. How do you tell when a camel's overbent? It's out in March 2012, and you can read more about it here: Susanna says it far better than I ever could so have wimpishly not attempted to summarise. 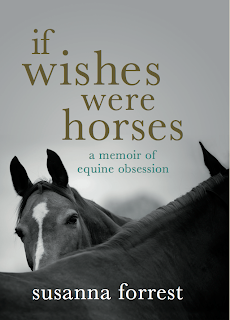 Linda Newbery has written about the danger of horses, and some of what was going on in her mind when she wrote The Damage Done. 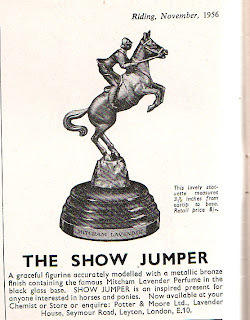 And if you like commercials, there are some gems here at Fran Jurga's The Jurga Report. And at Piccalilli Pie, the purples of a North Western American autumn. I'm decorating the house for autumn. Ha ha. Of course I'm not. It had never even occurred to me, I must admit, but I do every now and then read blogs where people do this. I'm actually very glad that they do, as I like to look on at those wonderfully decorative lives that are completely, utterly and absolutely unlike mine, which is frankly rather pants at the moment, for one reason and another. My parents didn't really do wallpaper - at least in the sense of applying any more. Our house had elderly and dodgy plasterwork, and my parents took the view that removing the wallpaper covering it would only cause a lot of problems no one really needed, and what was wrong with paint, after all? This did mean I didn't get horsy wallpaper. 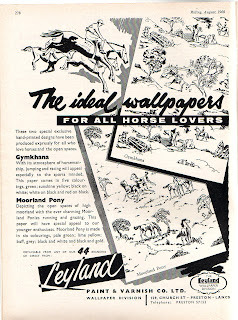 I would have liked horsy wallpaper. Our playroom had a field sports wallpaper with pheasants on it that I was very fond of. Shooting was a field sport, as was hunting, and hunting had horses, and that I knew was as close as I was going to get to wallpaper with horses on, so that pretty loose association satisfied me.